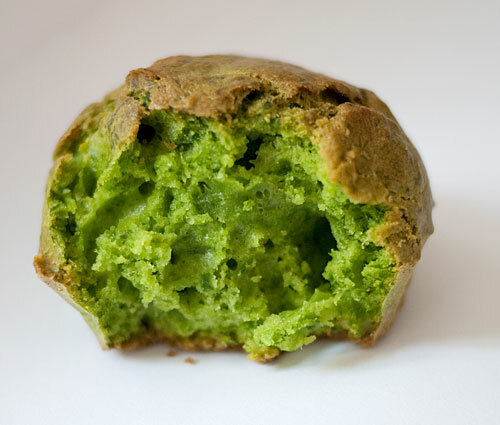 These little muffins take a bit of effort to make, since you need to make a pesto or a puree of vegetables first. But they are worth it. The muffin batter itself is very easy. Make a batch at a time and freeze the extras. 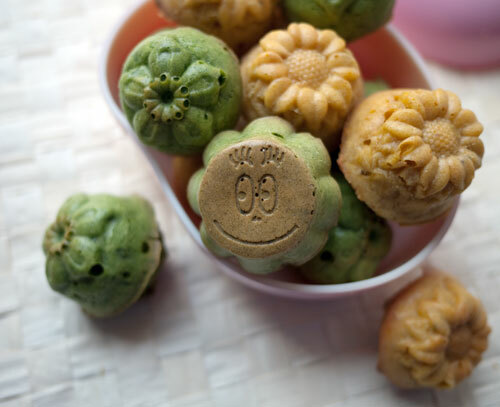 If you make them small enough, you can pull one out of the refrigerator in the morning and it will be defrosted and fresh-tasting at lunch time. 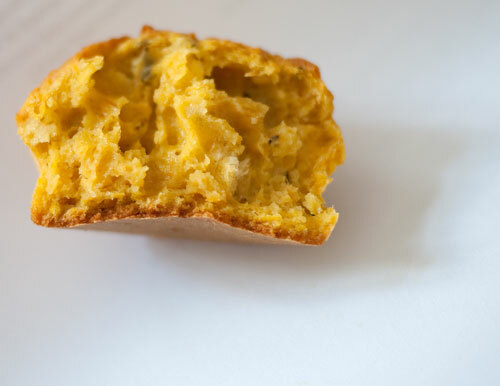 Savory muffins that are flavored with garlicky ramps. Great for bentos, especially when made in mini-size. In a bowl, whisk the eggs well, and add the buttermilk. Beat well to combine. Add the pesto and beat in. Add the sifted flour mixture, salt and pepper, and stir well to combine. Spoon into muffin molds or tins. Bake for 25 minutes for mini muffins, 30-35 minutes for larger muffins. Cool completely before packing into freezer-proof containers or bags to freeze. Muffins do go stale rather fast, so eat them within a day of baking and freeze the extras. Yield: Makes about 1 cup (240ml). Prep/cooking time is about 10 minutes. About 2/3rds of this is used in the muffin recipe, so keep the rest for a pesto-pasta meal! Carefully wash the ramps, especially if they were gathered wild. Pat dry with paper towels. Chop them up roughly. Put the ramps in a food processor with the chopping blade. Process until finely chopped. Add the olive oil as the motor is running, until a fine, bright green paste is formed. At this point you can add salt if you like, but I like to leave the salt out and put it in when using the pesto. 3, The pesto will keep for a day in the refrigerator. Freeze the pesto by putting it in a ziplock bag and pressing flat. You can then break a bit off at a time whenever you need it. These have a wondeful salty-sweet flavor. The yields and cooking times are about the same as for the ramp muffins, but allow extra time to make the carrot puree since you have to cook the carrots. You can make the puree in advance. In a bowl, whisk the eggs well, and add the buttermilk. Beat well to combine. Add the carrot purée and beat in. Add the sifted flour mixture, salt and dried thyme and stir well to combine. Cool completely before packing into freezer-proof containers or bags to freeze. Muffins do go stale rather fast, so eat them within a day and freeze the extras. This may look like carrot baby-food, but taste like heaven. It’s great on its own, spooned onto soup or pasta or rice, and so on. I saw a similar technique being demonstrated on the Masterchef Australia program (which is a terrific program by the way) where they used it on a plate of beautifully cooked baby vegetables. Grate or shred the carrots finely. Put the carrots into a small pan with a tight fitting lid, with the butter or olive oil and salt. Turn the heat up to medium, and put the lid on. Let it steam-cook in the pan until the carrot is tender, about 5 minutes. Stir to let any excess moisture evaporate. Mash up with a fork, or pass through a sieve if you want a very smooth puree. 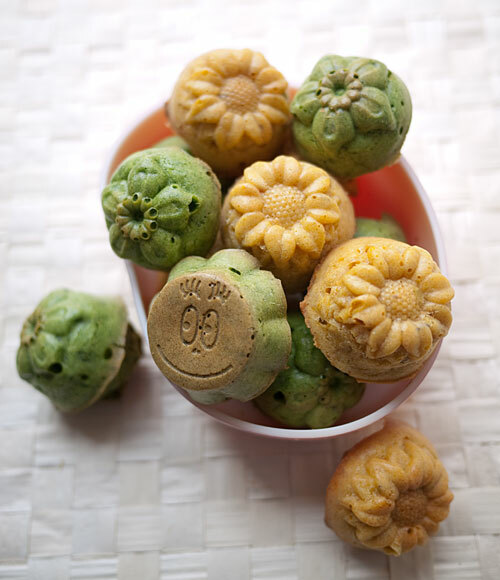 The flower-shaped muffins were baked in silicone muffin trays that I got from a French company called Patishop. They make the most wonderfully detailed molds for baking and making chocolates. I’m sure I’ll talk more about them in future posts here or on Just Hungry. The Barbapapa face came out very nicely on the bottom of the muffin. If you do use bento cups for baking, make sure they are made of silicone or other heat-resistant material. Most bento cups are not heat-resistant, and may turn into a nasty mess if they are exposed to oven baking! 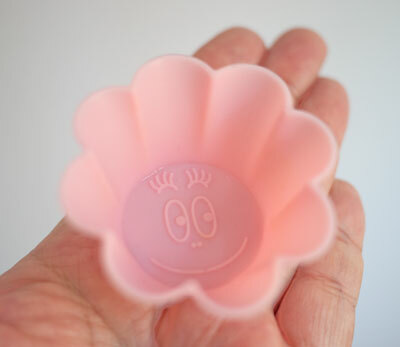 That’s why I prefer to stick to silicone for my bento cups, or use silicone cupcake/muffin cups as bento cups. Ramps and ramsons are very similar in flavor, and you can use either one for the pesto here. Ramps have a stem that looks like a little green onion or baby leek while ramsons have a thinner stem. Both have wide, smooth leaves that look like lily-of-the-valley leaves, and both are called wild garlic, wild leek, spring onion and so on. In French they are called ail de bois or “garlic of the woods”, and in German they’re Bärlauch or “bear leek”, apparently because the wild bears that used to roam the forests loved them. Bärlauch is very popular here in Switzerland. See more savory muffin recipes. This post came at the perfect time for me! I just moved, so my kitchen was out of sorts for a while. My kitchenaid stand mixer is now back on the prowl and I was just looking for something new and fun to make...enter your recipe! These look super tasty, and the molds are very pretty. I haven't tried ramp before, but it seems like something I would really like. Hi Sophie, if you click the ShareThis link (the one with the green icon) at the bottom of the post, you should see a menu pop up that allows you to share the posts in all kinds of ways. Yay! The woods near my house are filled with er...rampantly spreading ramps (well, wild garlic) so I will definitely be making the pesto, if not the muffins too. Seriously, the oniony-garlicky scent as you walk through the woods is so overpowering; it's just a good job I love the smell, and the taste! Just because baby food is home made it doesn't stop it from being baby food Maki. I always made my own baby food for my son, and I used to have to make a large pot of it because both his father and I loved it. It would be frowned upon these days, as it contained both butter and salt, but it was delicious. Always a green (silverbeet or runner beans), an orange/yellow (buttercup squash or sweet potato), and a white (potato) vegetable mushed up together with butter and salt. Oh yum. I wonder if muffins made from it would be good? I do pity babies who have to eat that stuff in a jar. I meant to say baby food from a jar is what I've never had, though the reason why my mother didn't feed it to me was because she didn't have the budget for it when I was a baby. My younger sisters got some jar baby food if I remember correctly. Hah. I'm not sure it was even available in New Zealand when I was a baby! A mouli was a standard kitchen item in those days, just for baby food. I don't think you were too far off mark, apparently babies now are not getting enough fat in their diets. I do plan on making my own baby food, eventually when I have a child, much like you made for your son. These muffins looks delicious, I love the Barbapapa face!!! Indeed, it is great that wild garlic is only available for a month or so, it is so good to actually look forward to eating it again next spring! Oh my goodness, these look amazing. Thank you so much for your recipe and these fantastic photos. I cannot wait to try these out myself. I bet I can get a lot of kids to fall in love with these. The online casino here is the best that there is for blackjack and the casino sounds make you feel as if you are gambling in a real casino. What a shame last week was the last week when ramps(didn't know they were called this)/wild garlic was available to me for the year. I'll be sure to remember this recipe for 2011. I live in Dallas (the 4th largest metro area in the USA) and I could not find ramps anywhere! However, the carrot muffins were awesome - thank you! I LOVE the sunflower ones, so cute! I want a mould like that. Just started cooking, could u just tell me what Tbs. and tsp. stands for ? If I am not mistaken, they are known as garlic chives in the US and nira in Japanese. Flavor wise they would work, though they make be more strongly garlicky than ramps. Give them a go and let us know how it came out! Do you know if Patishop ships to the U.S. and how much it would cost? Thanks. If you find out let me know! Sat, 2010-07-24 03:15 by anon. I am in the US and grew up eating ramps in West Virginia, and never heard them called garlic chives, just ramps (although garlic chives sound great). I think the person in Dallas might be in too warm a climate to find them unless they were shipped in. Now that I am not in WV, I try to go home and eat them in season, but if I can't and have a strong, strong craving I will sautee some spinach and a lot of garlic together to try and make up for it. I also think our ramps must taste a bit stronger, in some way. They do not have the burn garlic sometimes can, but they sure aren't mild. I love ramps! ;) I love the idea of trying them in a bread. Wed, 2011-07-27 11:32 by anon. Tue, 2013-08-20 00:44 by anon. dear Maki, hope you are well. I am a hillbilly by heritage and dig ramps every year to celebrate. I cook them with potatoes or ham, or add them to split-pea soup or to eggs. They don't keep long. Ramp pesto is such a brilliant idea and a wonderful way to preserve them --freezes well-- and to keep ramps alive! Meanwhile, Maki, I am reading Ruth Ozeki's A Tale for the Time Being. It was longlisted for the Booker Prize just a few weeks ago. It is making me think of you, and I hope you might give it a read. Have you read My Year of Meats, also by Ozeki? think you would like it as well.